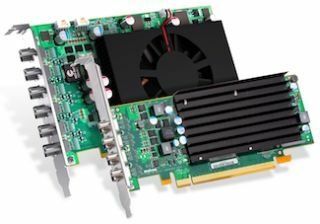 The What: Matrox will be showing its C-Series multi-display graphics cards at InfoComm 2016 at its booth, N2407. The What Else: C900 is the world’s first single-slot graphics card to drive nine 1920x1200 displays for 3x3 and 9x1 configurations, according to the company. C680 supports up to six 4K/UHD displays for high display density applications. C420 is the fastest quad card with passive cooling for increased reliability and silent operation. All C-Series cards come bundled with easy-to-use Matrox PowerDesk for Windows desktop management software to give users a comprehensive set of tools, including bezel management and EDID management, to easily configure and manage their multi-display setups.